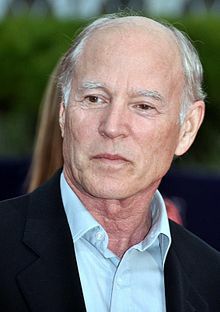 Frank Wilton Marshall (born September 13, 1946) is an American film producer and director, often working in collaboration with his wife, Kathleen Kennedy. With Kennedy and Steven Spielberg, he was one of the founders of Amblin Entertainment. In 1991, he founded, with Kennedy, The Kennedy/Marshall Company, a film production company which has a contract with DreamWorks. Since May 2012, with Kennedy taking on the role of President of Lucasfilm, Marshall has been Kennedy/Marshall's sole principal. Marshall has consistently collaborated with directors Steven Spielberg, Paul Greengrass and Peter Bogdanovich. In addition, he received the Irving G. Thalberg award from the Academy of Motion Picture Arts and Sciences in 2018. In 1966, he met film director Peter Bogdanovich at a birthday party for the daughter of director John Ford, a friend of his father. Marshall volunteered to work on Bogdanovich's first film, Targets (1968), which became his apprenticeship in film production, as he assumed various productions roles, even appearing in a bit part. Following graduation from UCLA, Marshall spent the next two years working in Aspen and Marina del Rey, as a waiter/guitar player at "The Randy Tar," a steak and lobster restaurant. While traveling through Europe in March 1970, he received another call from Bogdanovich, offering him a position on The Last Picture Show (1971). Three days later he arrived in Archer City, Texas, doubling as location manager and actor in this seminal film. Under Bogdanovich's guidance, Marshall would work his way up from producer's assistant to associate producer on five more films. He branched out to work with Martin Scorsese as a line producer on the music documentary The Last Waltz (1978) and as an associate producer on director Walter Hill's gritty crime thriller, The Driver (1978). The following year, Marshall earned his first executive producer credit on Hill's cult classic street gang movie, The Warriors (1979). He continues to collaborate with Bogdanovich, working to complete their tenth film together, Orson Welles' unfinished The Other Side of the Wind in 2018. His feature film directing debut was the thriller Arachnophobia (1990), starring Jeff Daniels. In 1991, he and Kennedy created The Kennedy/Marshall Company and began producing their own films. Marshall directed the company's first film, Alive (1993), about a rugby team struggling to survive in the snow after their plane crashes in the Andes. Next, he directed Congo (1995), based on Michael Crichton's novel, followed by Eight Below (2006), an adventure about loyalty and the bonds of friendship set in the extreme wilderness of Antarctica. In 1998, he directed the episode "Mare Tranquilitatis", from the Emmy Award-winning HBO miniseries From the Earth to the Moon. As part of ESPN's 30 for 30 series, Marshall directed a documentary about Olympian Johann Olav Koss entitled Right to Play (2012). (the name of Koss's humanitarian organisation). Marshall stated that the documentary, broadcast in 2012, sought to capture not only Koss' sporting career and the ideals behind his nonprofit organization, but also his "drive and how it has changed the world." ^ Ross, Alex (September 26, 2018). "How Orson Welles's "The Other Side of the Wind" Was Rescued from Oblivion". The New Yorker. Retrieved October 11, 2018. ^ Hopewell, John; Keslassy, Elsa (June 5, 2012). "GKIDS plants N. American flag on Poppy Hill". Variety. Reed Business Information. Retrieved June 6, 2012. ^ Amidi, Amid (March 12, 2014). "GKIDS Acquires Takahata's 'The Tale of The Princess Kaguya' for U.S. Distribution". Cartoon Brew. Retrieved March 19, 2014.